Boston (and its surrounding towns) is a fun place. With plenty of drinking opportunities, both large and small. I'll be looking at exactly that today: one large and one small bar. Two very different places, demonstrating the diversity of Boston pubs. But ones which evoked very differing emotions in me. Quantity or quality. Though it isn't always a simple choice between the two. It can be much more nuanced. And, let's be honest, there's a difference between quantity and true choice. We'll be getting back to that later. First I'll introduce you to the pubs. Yard House and Deep Ellum. Yard House is very new. It had only been open a few days when I dropped by last week. It's part of a national chain of beer bars. No, not like Wetherspoons. Much more American than that. Yard House is a barn of a place, offering 180 tap beers and seating for 700. Yes, you read that right, 180 taps. And that's just the start. They've the capacity for even more. It's hard to see where they'll put the new ones, the back of the bar - the usual place for taps in American beer places - already bristles with a continuous line of handles, like soldiers on parade presenting arms. The beers selection has been well thought out. Mostly beers with a liquid* reputation. The type of beers that moisten the underwear of geeks the world over. Bold, brassy beers that left their subtlety in the cloakroom on their way in. 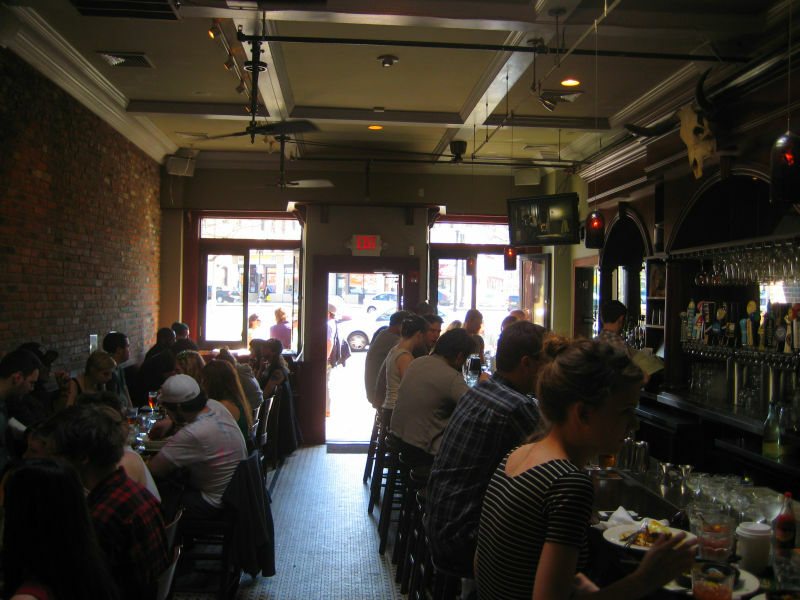 Its location - close to Fenway Park - is crammed with loud, crowded bars. Big brash bars, seemingly shouting to attract stray passing drinkers. Yard House is the largest and one of the loudest. Understated it isn't. But who, apart from the commercially suicidal, would open a low-key bar in a high-key spot? Deep Ellum is a long way from Yard House, philosphically if not physically. Nestling in a row of modest brick-fronted shops on a busy main road, in the suburb of Allston. You could fit the whole pub behind the bar of Yard House. The long bar running the length of one wall and the carved bar back give it the pubby feel I love. I've a recurring complaint when drinking in the USA. Why isn't there anything below 7% ABV? St. Bernardus Abt is my regular tipple, so I'm no stranger to strong beers. But I like my sessions long. And my legs to stay functional. It's a rule of mine: remain capable of standing up and walking out unaided. Sometimes you need to drink without consequences. Deep Ellum's beer selection is far smaller than Yard House. Smaller probably than the choice in many of Britain's new wave of thwug** bars. Small but perfectly formed. Just 26 taps, including one beer engine. I've a recurring complaint when drinking in Britain. Why is there nothing but Bitter between 3.8% and 4.2% ABV? I like a little more variety in style and strength. When I was in Deep Ellum on Sunday, 10 of their 26 draught beers were 5% ABV or less. Three were under 4% ABV. The others filled all the slots up to 10% ABV. Now there's real choice. The same with the styles: a German Pilsner, a German Kellerbier, Smoked Lager, Rye Ale, Rye Lager, Hefeweissen, Bitter, Brown Ale, Lambic, Tripel, Golden Ale, Saison, Stout, Imperial IPA, Witbier, Amber Ale, Belgian Pale Ale, three standard IPA's, and what I would call a mid-Atlantic Pale Ale. Drinking in Yard House was a challenge. First finding a seat. Then getting served. And finally having a conversation. What with the music and the braying hordes, shouting was the only way to communicate. Really not my scene, man. I like a seat and a chat. Oh, and light. So I can read a book or a newspaper. Dann and Martha had to rush to the brewery on Sunday. I was on my own. Where to go? I didn't hesitate for a second. It had to be Deep Ellum. I couldn't think of a better place to while away a lazy Sunday afternoon. I squeezed in at the end of the bar. It was busy, but not deafening. And plenty of light to read my book (The Local, if you're interested). The hours flew by. Aided by generous quantities of Pretty Things 1838 X Ale. Which was drinking wonderfully, drawn from a cooled cask on the bar. I couldn't have held out 10 minutes in Yard House. Now don't get me wrong. I'm not saying Yard House is the work of the devil. I'm sure plenty have a great time in there. Just not me. I like my pubs intimate and individual. Where the hand of the landlord is visible, even when he isn't physically around. Deep Ellum is very much Max's place. And long may it stay so. * I know the standard adjective is solid, but I refuse to use that word to refer to something that is irrefutably liquid. ** I also refuse to use the C-word. The answer to why US bars have a tendency to sell high ABV beers is the same as I replied to your comment on my post about a bar that would sell only one kind of beer, on drinkdrank. I think it comes, more often than not, from the distributor rather than from a conscience effort by the bar owner to sell only strong beer. I think the sale reps push strong beer to make bigger sales on their end. Beer in the US is a slave to the distribution, three tier system of brewery to distributor to retailer. Because of this system, the distributor not only gets to set the price, but chooses what beer will or will not get distributed, how shall I say, "effectively." Is this the case at every distributor? No, just as every bar in the US doesn't only sell high ABV beers. Granted Americans do like big beers, but it's not just a patron preference issue—there is a little outside influence, as well. Good observations and I'd make the same ultimate choice, but as always it's horses for courses. Yard House is not the smaller, intimate pub many Europeans are familiar with. (I say many because the noisy beer hall experience is well-known in Germany and some other areas, albeit without the huge range of beers). The American big bar suits groups, often as you said going to, or returning from, sports and other entertainment. I believe too the demographic there is generally younger. To me it's a kind of combination of the German beer hall, the post-1960's sports bar and a 1990's-style beer festival. The smaller bar mentioned is IMO of the type increasingly found in North American cities and I believe is slowly making itself known in the U.K. or at least London. It's where you have a smaller but well thought out selection and the place caters to different ages and backgrounds. Often it's in an older building or one made to look so, for a comfortable, old-fashioned feeling. And bravo on your refusal to use that useless marketeering term! One of the rare times when I've thought to myself, "this beer in my glass is exactly the beer I want" was when I've had a helles-style lager. Rich in the pure grainy malt arena with just a touch of bitterness to keep things grounded. I'm often confounded when bars with 30 or more taps don't have anything in a German-style lager. Much less a real German lager. More isn't better. More is still just more. Lots of people still confuse this equation. Perhaps, particularly, Americans. As an american, I'll throw my vote in with Deep Ellum & similar bars. Big, smack you in the face beers are the new macro-brewed light lager for the big spender. The beer landscape is changing bringing a mixed bag, but overall things are improving. The increasing number of places offering such a broad range of beers is proof enough for me. Ah Deep Ellum... my former local. How I miss it so. Deep Ellum is one of the best beer bars in the United States. Yardhouse serves a totally different purpose for me-this is where I can take my family (not beer drinkers) for a decent lunch, and I can get a decent beer after some time sorting through the massive beer list, and everyone enjoys it. But if I want a real beer experience, a place like Deep Ellum is as good as it gets. I'd have sent you to a 6 tap place over Yardhouse in a heartbeat. GQ called the stretch of bars where Yard House is located: "the world's largest frat party." 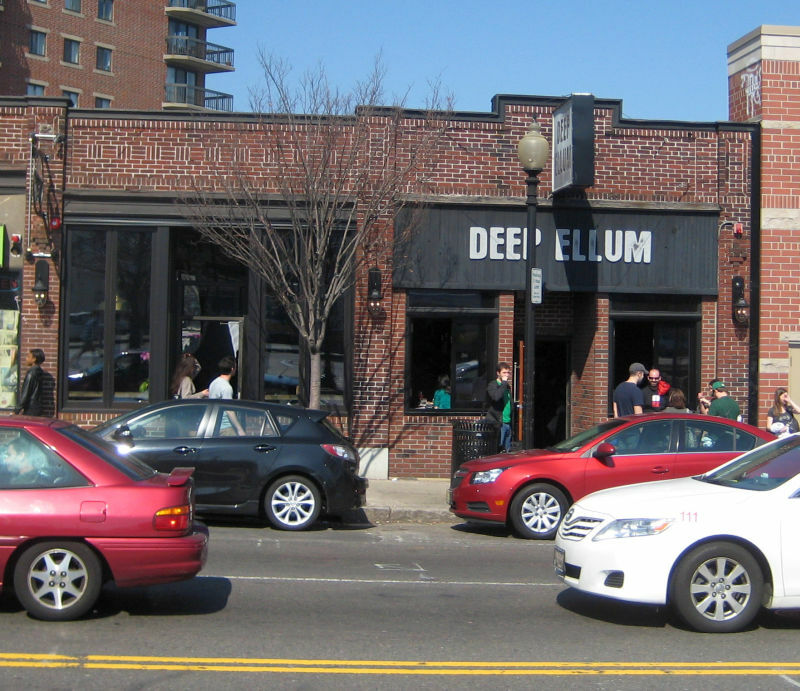 Don't go telling too many people about Deep Ellum--it'll get too crowded. Just how dark could it be in Yardhouse during the middle of the day? I have been to several Yard Houses and admire them, but share your feelings, Ron. Especially at night, I find them too chaotic, particularly so if a sporting event is nearby. But they are the stadium show compared to the intimate club gig: there are plenty who will line up for the former and far fewer who appreciate the elegance of the latter. To each his or her own. P.S. If you're still in Boston, try Lord Hobo in Cambridge. Great place, I thought -- though I was there at a quiet time -- and not far from Cambridge Brewing. Yeah Deep Ellum is one of my favorites. I was there Saturday night that same weekend. Unfortunately the casks of 1838 and 1945 Mild had run dry just before I got there. A better loud place with huge beer list is just a couple of blocks down the street in Allston called Sunset Grill and Tap. I like it better than Yardhouse at any rate. Stephen, I drank in Lord Hobo earlier in my stay. It's a pretty good bar, too. Anonymous, I was surprised at home effectively they blocked out all the natural daylight at Yard House. No way to work out what time of day it was once inside.